It is our pleasure to welcome you all to Yorkshire - “God’s own county” in the United Kingdom. The ESPU congress is being held in the UK for the first time in 20 years, the last occasion being in London in 1996. 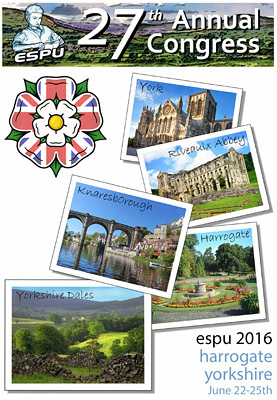 The 2016 annual ESPU meeting will be held from 22-25th June 2016 at the Harrogate International Convention Centre (HIC). Harrogate is an elegant spa town in North Yorkshire, which is widely regarded as offering amongst the best quality of life in the UK, being voted the happiest town in the country in a recent national poll. Harrogate hosted the first day of the Tour de France in 2014. Harrogate is close to the scenic countryside of the Yorkshire Dales National Park as well as many historic sites and beautiful historic houses and gardens. The town’s motto is ‘arx celebris fontibus’ which translates as ‘a citadel famous for its springs’; the first spring having been discovered in 1571. On the scientific front, we are confident that the program will be stimulating and rewarding from an educational point of view. All the conference hotels are located within only a few minutes walk of the conference venue in the centre of town. There will be plenty of opportunities for relaxation and networking with friends from across the globe amidst the gardens and greenery of Harrogate in bloom. Enjoy a sumptuous afternoon tea in the internationally renowned Betty’s Café or a refreshing beer in a traditional English pub. The social program will offer delegates and accompanying persons an opportunity to step inside the medieval city walls of York to visit one of the most historic cities in Europe. The magnificent Minster is the largest gothic cathedral in Northern Europe and York is steeped in history dating from Roman and Viking times. Other planned excursions include the Royal Horticultural Society’s beautiful gardens at Harlow Carr and Fountains Abbey – a World Heritage site .